"African Black Tail Scorpion". This species is formerly known as P. liosoma, but Fet et al. (2000) conclude that leiosoma is the original spelling. Acosta & Fet (2005) changed the name back to P. liosoma. Africa (Egypt, Ethiopia, Kenya, Somalia, Sudan, Tanzania). Asia (Saudi Arabia, Yemen). Arid/semi-arid grassland/savannah. Moderate humidity. Don't dig burrows, but use natural space/burrows under stones and other objects. Few medical data available, but probably moderate venomous. One case is reported from Saudi Arabia by Goyffon & Vachon (1979). A 50 old female was stung in the toe, and experienced a immediate, persistent pain in the lower extremities. In the hours after the sting the patient showed arteriell hypotension, anxiety and agitation. No thermal abnormalities was observed. After medical treatment of the symptoms (no anti-venom was used! ), the general condition of the patient improved after three hours. The local pain didn't go away until 36 hours after the sting. No venom squrting ability. Probst, P. J. (1973). "A review of the scorpions of East Africa with special regards to Kenya and Tanzania." Acta. Tropica 30(4): 312-335. Goyffon, M. & M. Vachon (1979). Arachnids of Saudi Arabia: Notes on poisoning accidents through scorpions in Saudi Arabia. Fauna of Saudi Arabia, vol. 1, pp. 67-68. Rein, J.O. (1993). 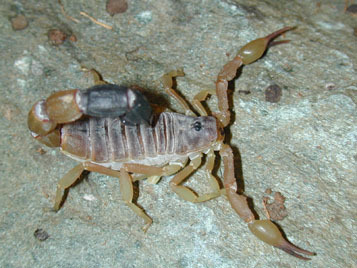 Sting use in two species of Parabuthus scorpions. J. Aarchnol., 21, pp. 60-63. 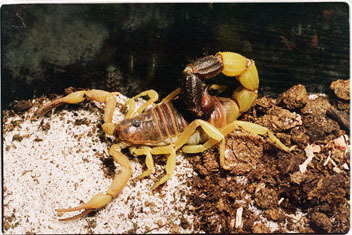 Sting use in two species of Parabuthus scorpions. Article in full-text. This spcies is a medium sized scorpion where the last part of the cauda is darker than the rest. This species is found in some pet collections (at least in Europe). Should not be kept by novice keepers. No current research on the species is known.